Hygrometers and Hydrosensors to establish the extent and degree of water migration. Thermohydrometer to determine temperature and humidity to aid in the drying process. Turbo dryers - designed to increase the rate of evaporation, which in turn increases the rate of drying. Turbo Vent Systems - which have the ability to dry wall cavities, under cupboards or flooring and enclosed areas that cannot be reached by other methods. Dehimidifiers - used to quickly remove excess moisture from the air so the evaporation of water from wet materials can take place and the potential for secondary damage is eliminated. Ozone generators are utilised to create ozone, which is a natural disinfectant , and effectively eliminates odours. Pairing and masking agents are also used in odour control. When hit with a water damage emergency or flood disaster, you want an expert water damage recovery team you can count on. Restore Tech offers restoration services for residential and commercial properties. We'll take care of you no matter what degree of water damage you are experiencing. We'll restore damage caused by fire, smoke, ash, and soot. And, we'll extract all of the water used to extinguish the fire and dry out your home and belongings. We'll even work with your insurance company to take care of you and your situation. Helping to get your life back to normal quickly and restore your home or business back to like-new condition. We are also the borders leading FIRE and FLOOD restoration service, using the latest technology and a comprehensive range of specialist restoration equipment. Moisture meters are used to detect excess moisture in various materials including carpet, plaster walls, timber and concrete. It is essential to determine the extent of the water damage to your home or business premises to enable the successful restoration of the building and contents. A Thermohydrometer is used to measure temperature and humidity and can provide a good indication on the progress of the drying process within a building. These air movers ( pictured above) are designed to operate 24/7 and are essential in the drying process. 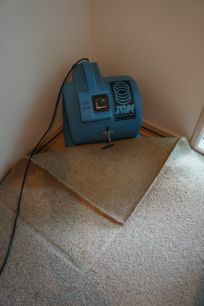 They are intalled under or on top carpet to effectively dry out concrete slabs, timber flooring, underlay and carpet. A dehumidifier is used to dry a water damaged building, carpet, furniture and contents. The machine draws in moist air, removing water vapour from the air and then pushing out dry air. A water damaged building will have a high humidity level so a dehumidifier works by reducing the humidity level, and in conjunction with turbo dryers provides an ideal drying environment.